NEW YORK (AP) The Portland Trail Blazers already secured a winning trip even before reaching the final stop. They wanted better than that. Damian Lillard scored 32 points and the Trail Blazers wrapped up a strong five-game journey with their third straight victory, beating the New York Knicks 103-91 on Monday night. Pat Connaughton added 17 for the Trail Blazers, who also won at Memphis, Brooklyn and Washington while losing only in Philadelphia. They needed to come from 17 down in the fourth quarter to beat the Wizards last time out but were in charge of this one most of the way. ”Overall if we would’ve said we could go and win four games, I would have told you I’ll take it,” Blazers guard CJ McCollum said. Kristaps Porzingis returned from a one-game absence and scored 22 points, but the Knicks were without starting center Enes Kanter for a third straight game because of back spasms. They lost all three, falling back to .500 at 10-10. The Knicks blew big early leads in the last two losses, in Atlanta and Houston, but mostly played from behind – sometimes way behind – Monday. New York never led by more than two and trailed by as much as 26. Lillard made the last basket of the third quarter and he won’t have any easier ones all season. 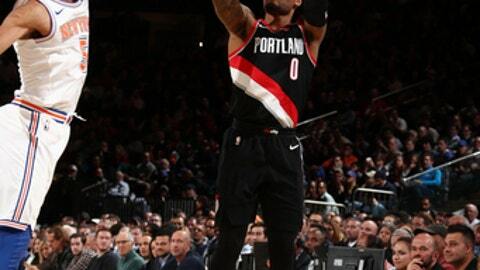 Shabazz Napier stole the ball while the Knicks were on the fast break and threw it down to Lillard, who had remained behind on the other end. He dunked the ball with no other players on that side of the court to make it 90-64. The Knicks couldn’t guard him when they were close by, either. Lillard had 17 points in the third on 5-of-7 shooting. The Blazers led 30-23 after one and quickly opened a lead the Knicks never cut into. They scored the first nine of the second quarter to open a 16-point cushion, and that’s right it was at halftime after Noah Vonleh’s basket at the buzzer made it 53-37. Trail Blazers: Lillard moved past Rod Strickland – also a former Knick – into fourth place on Portland’s career assists list. He now has 2,575 and joints Clyde Drexler and Terry Porter as the only players in franchise history in the top 10 in scoring and top five in assists. … Portland has won nine of the last 11 meetings. Knicks: With Kanter out, the Knicks activated Joakim Noah and gave him his first playing time since last February, before he was injured and then hit with a 20-game suspension for violating the league’s anti-drug policy. … Tim Hardaway Jr. had 16 points. Noah checked in to a nice cheer in the second quarter and had a decent three-minute stint, making his only shot attempt and grabbing a rebound. He had been inactive since his suspension ended earlier this month and didn’t even make the two-game trip to Atlanta and Houston. Portland held an opponent below 100 points for the 12th time, improving to 9-3 in those contests. The Blazers came into the game tied for second in the league for most times holding teams below the century mark. Trail Blazers: Host Milwaukee on Thursday. Knicks: Host Miami on Wednesday.